For the price and overall performance you get for that price, the Anker Wireless Charger is hard to beat. It is small which makes it easy to travel with or taking up a small amount of desktop space while it performs very well from a charging time perspective. For sure there are faster chargers out there but often at a much higher price. If you want to use wireless charging for the first time or are looking for a second charger to have by your bed or on a table in your living room, this Anker solution is an excellent choice and one to consider. First, in order to use the Anker Wireless Charger, you have to have a Qi compatible device. Given that there a few wireless charging technologies, you will need to make sure that your device will work with this charger. To date, Asus, HTC, Huawei, LG, Motorola, Nokia, Samsung, Blackberry and Sony have all standardized on Qi technology which, from an Android perspective, covers a significant number of devices that are out in the market. You will need to make sure that your device is compatible prior to purchase as if you have another technology – Powermat, A4DP – it will not work with your device nor with this charger work for you. For the purpose of this review, I used my Motorola Nexus 6 and my Asus Nexus 7 (2013) tablet in my testing. 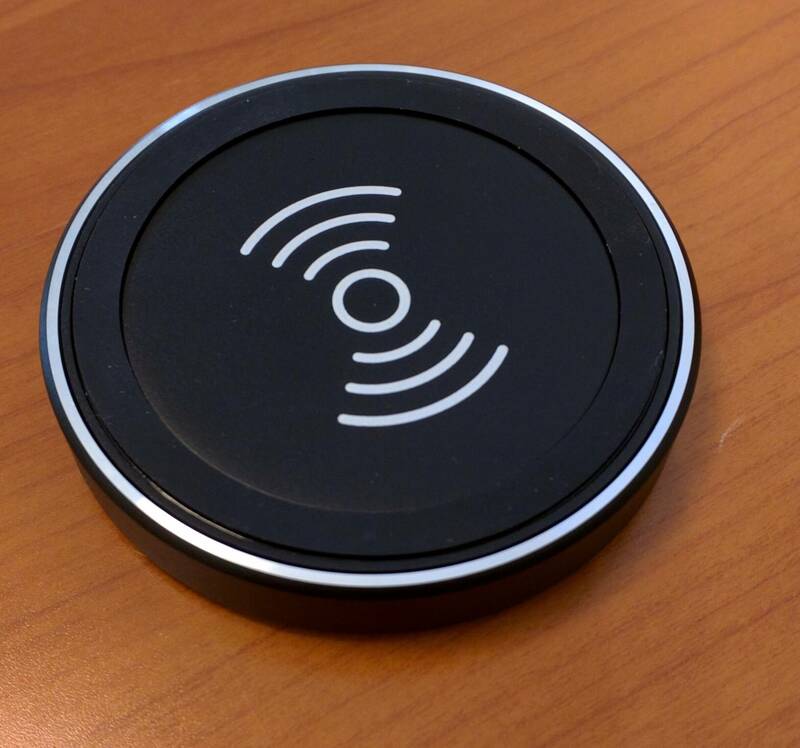 The Anker Wireless Charger is a disk shaped pad that is 2.6″ in circumference, is .8″ thick and weighs in a 2.08 ounces. It is a small, lightweight solution which makes it easy to travel with or leave on your desk at home without taking up a lot of space. On the edge of the pad you will find the MicroUSB connector to connect the pad to power. It ships with a standard MicroUSB to USB cable so you can plug it into a AC adapter or even your PC to charge your phone. On the opposite of the edge you will find two small LED lights. The red light indicates that the pad has power, while the blue light is your indicator that your device is charging. That blue light will turn off when your device is fully charged. From a compatible phone or tablet perspective, there is no additional configuration required to use the Anker Wireless Charger. On all devices, wireless charging functionality is enabled and it is just a matter of using your device with a compatible charger. The biggest challenge most users face is exactly where you place your phone on the pad to get it to charge. You will need to look up exactly where you need to place your phone on the pad. In my case, for the Nexus 6, I place the device with the U in Nexus on the back in the center of the pad. On my Nexus 7 (2013), it was more in the exact center of the back of the device. Once I had the device in position, I received an audible tone to let me know that charging was happening and the charging battery icon appeared on the device. The additional confirmation of the blue LED on the pad itself helped me know it was charging too. When I received the Anker Wireless Charger there were two things that I was concerned with before even opening the box: Charging speed and device cases. I’ll deal with the latter first because that was the quickest to resolve. It was a non-issue for me. On my Nexus 6 I have the Case-Mate Clear Naked Touch Case while on my Nexus 7 (2013), I use the Google made case for it. In testing with both devices, I had no problem getting connection with the pad and the device. While Qi charging’s standard accounts for up to 1.6″ of distance between the charging pad and the device, I was still concerned I would have to remove the device from the case. That was never an issue and I put that one to be pretty quickly. Keep in mind that to use it through a case, you will need to have a thin case on it. 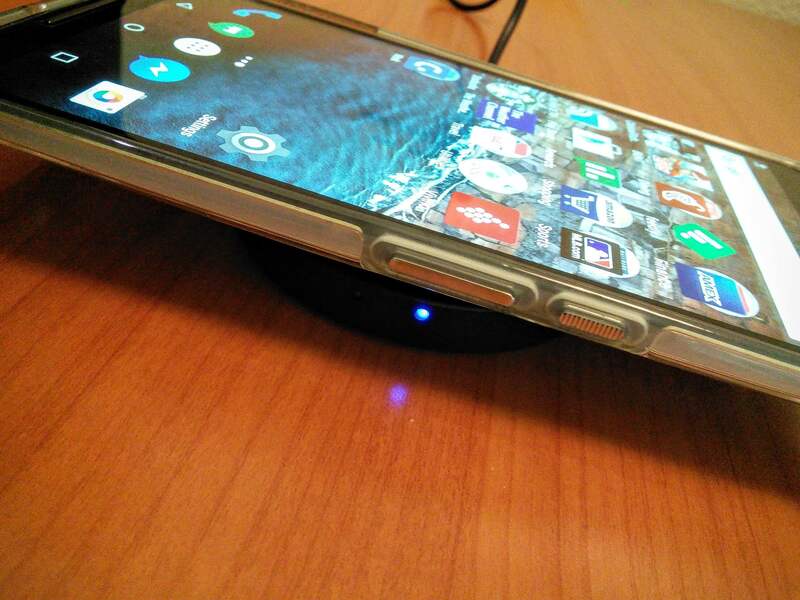 I tried, for example, to use the Anker Wireless Charger with my Noreve Folio case for my Nexus 6 and it would not connect as the case was just a little too thick. My second big concern with this device was the speed at which charging would happen. The Anker Wireless Charger is a single coil pad meaning that it is not going to put out as much inductive charge as a dual coil charger would be able to produce. This, like my case concern, has proven to be a non-starter. Make no mistake: Yes, it is slower than connecting either of my devices to AC via the MicroSD port on them. However, it wasn’t painfully slower. For this review, I depleted my Nexus 6 to 25% and the connected it to AC via the MicroUSB cable and the QuickCharge 2.0 adapter that ships with the phone. To get to 90% took about 20 minutes. I then depleted it again to 25% and then used the charging pad to charge the device. To get to 90% took about 35 minutes. The additional time and any pain involved with it is really going to depend on how you use the Anker Wireless Charger. If you need a fast charge on the go, keep using AC and the MicroUSB cable or look for a dual coil charging pad. If however it is sitting on your desk and simply charging between trips away from your desk, it works perfectly. In fact the most handy way I found using this device was on my night stand where I could charge my Nexus 7 each night after my normal evening reading time. I didn’t have to fish out the cable to charge it – which always ends up buried under the bed somehow – and fuss with connecting it in low light. I just laid it on the pad and turned the lights out. Ultimately you have to make the decision on if this is the right device for you when it comes to charging times but for my use case, it worked great and fit my needs. “Yes, it is slower than connecting either of my devices to AC via the MicroSD port on them.”. Ha! Good catch! I’ll fix it later this morning. Thanks! Another one for you: consider changing the word “be” to the word “rest”. Further down when you talk about your experience using the charger with your Nexus 6 (I think) you are missing an “n” on the end of a “the” probably needs to day “then”. I know you are very busy…My apologies for being nitpicky, it’s only because its second nature, I am a Senior SQA Analyst (glorified testing Minion) and believe you are great at what you do and want you to be greater if not the greatest.